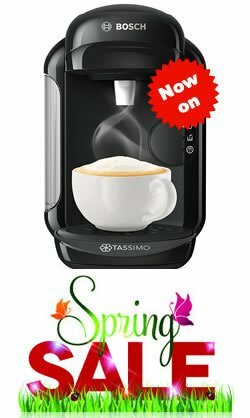 Looking for Cheap Tassimo Pods and Best Offers? Tassimo pod coffee makers are great for families or individuals who have a wide range of tastes because these compact machines have so many flavour options. 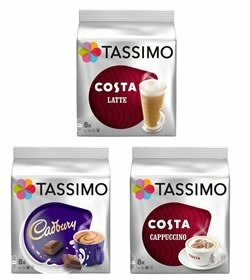 The range of Tassimo pods is so big that you likely have not heard of all the flavours and types of drink you can make with them, and it’s not limited to just coffee, you can also get a wide range of teas and hot chocolates in capsule form too, something for all the family or mood. 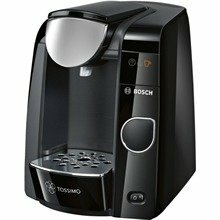 What are the Best Tassimo Coffee Pods you can buy? What Tassimo flavours are available? Are Tassimo pods ESE pods? 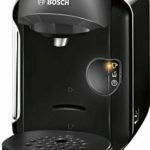 Which Bosch Tassimo coffee machine is best? Tassimo or Nespresso, which one is best? 2. Do you Want Lots of Drink Choice? Are coffee pods good for you? Can you recycle Tassimo coffee pods? 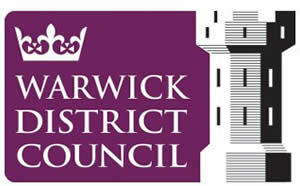 Local councils trying to help us go green! Pods range from simple espresso, cappuccino and latte to all sorts of flavours like caramel latte macchiato, vanilla latte, Yunnan espresso, chocolate caramel, chai tea latte, mocha and lots lots more. The tea ranges are also varied with lemon, peach, Marrakesh style, Twinings ranges, herbal and tea latte to name but a few. What this really means is that pod coffee makers aren’t just great for families, they’re great for everyone, especially when you have visitors. 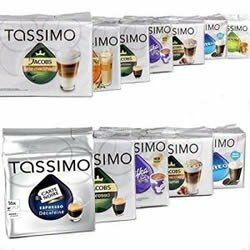 You can find Tassimo pods on offer at a lot of local supermarkets from time to time, but if you want to always buy your Tassimo pods at the lowest prices, it is best to buy online. Internet sites like Amazon and others always have lots of offers all of the time, especially if you buy in bulk. So, do yourself a favour and do not pay over the odds when you can get your favourite flavours at a great price by following our offers. 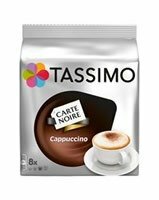 As we mentioned earlier, you can find some great deals online to bag yourself some cheap Tassimo pods whenever you want them. We used to have to wait till supermarkets had them on offer but no more, today, we can find cheap t-discs online at websites like Amazon or Ebay whenever we need them, which is great news for you and your pocket. Happy drinking is what we say! 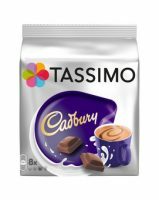 Amazon offer the cheapest tassimo pods we have found if you use the system smartly! You can get 80 t-discs for £16.95 which works out at about 21p each, which is not bad. But, if you are smart, you can combine the subscription part of Amazon with their decent bulk prices and reduce the price by between 5% – 15% depending if you subscribe to other products. This reduces the price per pod down to just 18p. The discount shops offer some good deals but be warned, they run out VERY quickly when they are in stock. If you are lucky enough to see them in store, you can grab some for 25p per pod, which is pretty good but still not as cheap as buying them from Amazon without any discount. 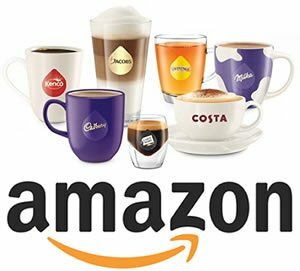 Groupon often have deals on Tassimo pods and accessories but you need to make sure you check the price v this list, as sometimes it might look like you are getting a good deal when it is actually more than Amazon or the high street. So check the prices first! The cheapest we have found them for on Groupon is 27p, which is still pretty good. It is worth looking out for promotions as this is by far the cheapest way to buy Tassimo pods at supermarkets. The best we have seen are the 3 for £10 offers which pop up every now and again but even with the offers it still works out at 42p which is just too much for us personally. Lastly, you can buy directly from the Tassimo store but it works out as the most expensive option. To get anyway close to a deal, you have to register your machine, sign up for the newsletter and then find offers on the store. However, the best we have seen with this combination is 45p per pod which is simply not worth the hassle when you can get them from everywhere else for cheaper! An absolute classic in our office and one you will definitely love if you have not tried it before. Lovely foamy milk on top for a perfect cappuccino every time. Another frothy hot drink but this time the classic Cadbury’s chocolate taste is perfect for any time of the day. Great little pick you up whenever the day is getting a little stressful and just need to unwind with some quiet time. Kenyan coffee with a really smooth taste, this is a classic in every sense of the word and one which we run out of stock of far too much. Perfect latte macchiato every time with this t-disc. Great combination of espresso, creamer, and foam in three distinctive amazing layers. If you press the button on this latte you are going to get a foam topped silky smooth latte made from Costa coffee beans which have been roasted to perfection to produce a beautiful espresso for your latte. What can we say, we love a good latte. Ok, so the kid in us loves Oreo’s, which is why it is a no brainer that we love Tassimo Oreo t-discs. If you have not tried these in the past, give them a go, you will love them. Made with Arabica beans, this Colombian coffee from Kenco is smooth and has a great taste. With a fruity but balanced taste, you are going to enjoy this coffee any time of the day. Tassimo pods are not just about coffee, they also make great tea and because we are British, we love Assam tea, so the English Breakfast tea from Twinings is a perfect choice every time. If you love your tea, you will love this one. Germany’s Jacobs espresso is a wonderful well balanced espresso with rich and fruity tones & a gorgeous crème layer that make for a great cup of coffee, especially on the way out of the door in the morning. 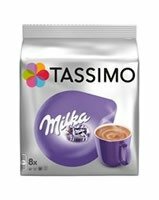 Coffee and chocolate are two of our favourite things, so when Jacobs put them together, you can be assured that you will enjoy this tassimo pod over and over again. Honestly, with so many great choices, you are going to end up drinking a lot more coffee than ever before! The Tassimo range has 65 flavours and options to choose from, so you are never going to run out of choice! There are so many flavours available that it can be difficult to choose something new, below are a few of our favourites or you can see the full range in our Tassimo Pods guide, find a new flavour today! The Bosch pod range all use the Tassimo pods system of pods which are not compatible with the Nescafe Dolce Gusto capsule system so if you buy a Bosch pod coffee machine you are restricted to using the branded Tassimo pods and no others. The flavours available in the Tassimo pods system is excellent with over 65 flavours available compared to 41 for the Nescafe Nespresso system. So it really is swings and roundabouts as to which you prefer. With all the pods you have laying around, you probably need a disc holder to put them in, with that in mind, take a look at our guide to Tassimo disc holders and see how much easier you could make your life and declutter your kitchen today! Another question we get asked a fair amount is, ‘Are Tassimo pods ESE pods?’. If you are just starting out in the world of Tassimo or coffee pods in general, this is a very good question and the answer is simple. No. ESE pods look like tea bags and are basically ground coffee between two paper filters which would not fit into your Tassimo coffee machine, whereas Tassimo pods are sealed plastic pods with a barcode to tell your coffee machine the water temperature and amount of water to dispense. If you want more information on which coffee makers work with ESE pods, take a look at our coffee pods guide. Founded in London by Italian brothers Sergio and Bruno Costa in 1971, Costa has become the nation’s favourite coffee leader within the UK and the second largest international coffee shop operator. Passion for coffee excellence and creating brother’s family business and although Costa has grown in scale these values are still held dear. Costa continues to have experience. Coffee lovers are now able to enjoy their favourite Costa coffee in their own homes using TASSIMO. The TASSIMO Americao was carefully developed to ensure that the unique taste of Costa’s Mocha Italia blend is maintained. Awarded “Best Branded Coffee Shop Chain in the UK and Ireland”” by Allegra Strategies for three years running. 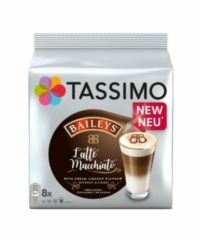 New to the Tassimo pod lineup is the Baileys Latte Macchiato. If you are looking for that fantastic espresso, with a Baileys creamy liqueur flavour and foam, you are in for a treat, as this drink is what you have been waiting for. This is sure to become one of your favourites as soon as you taste it. We love it and we are sure you will to. and you will love them, just like us. Twining’s have made tea more than simply part of a daily routine. They have been producing fine teas for over 300 years now and you will find a tea for any occasion or mood. It all started in 1706 when Thomas Twining decided to buck the trend of coffee and beer and stake his reputation on tea. Back then, tea was new and not very popular as it had only just been imported to England a few years before, so most people had not really taken to it. But not Thomas, he saw that this was the hot drink of the future for English mean and women and so he started to sell it from his coffee house which was situated on London’s Strand. He sold only the finest teas and the rest is history as they say. Today, Twinings carry on the same tradition of producing only the best tea, and luckily for you, it is now available for your Tassimo machine. After all, Tassimo is not all about coffee! John Cadbury opened a shop selling amongst other things cocoa and drinking chocolate that he prepared himself using varieties of drinking chocolate with names like ‘Churchman’s Chocolate’, ‘Spanish Chocolate’, and ‘Fine Brown Chocolate’. In 1861 John handed the business over to his sons George and Richard. They believed strongly in improving the conditions for their employees and George stated ‘No man ought to be condemned to live in a place where a rose cannot grow.’ George went on to build the famous ‘factory in a garden’ in Bournville and the Cadbury company became famous for being a good employer. Today, Cadbury hot chocolate is fairtrade certified which ensures fair wages for the suppliers of cocoa. Philippe Suchard, a passionate Swiss chocolatier with a vision to make chocolate accessible to everybody, opened his first confisserie in 1825. The Milka brand was born in 1901, a 100g tablet in a lilac wrapper with alpine setting and a cow. The name was created using two kakao (cacao). Since then, more and more people have fallen in love with “the most tender chocolate made of alpine milk”. The Lilac Cow was created in 1972 and has become one of the most beloved and famous brand icons in Europe. Lila, as countries children paint cows lilac. In 2012 Milka celebrated its 111th anniversary with consumers across Europe offering special products and brand experiences. Make the best out of each coffee moment thanks to the UK’s most famous coffee brand. Kenco coffee is one of the UK’s leading coffee brands. Its origins date back to 1923, when a cooperative of Kenyan coffee growers set up the Kenya Coffee Company to distribute high quality beans to Britain. And thanks to Kenco’s commitment to buying 100% of its beans from Rainforest Alliance Certified™ farms, you can enjoy the perfect coffee shop experience at home while doing your part to help both coffee growers and the environment. Carte Noire was created in France in 1978 by René Monnier and revolutionized the country’s coffee market with its pure Arabica and premium features. Today Carte Noire is the leading coffee brand in France. An intense aromatic blend, made with 100% pure Arabica beans – for a truly desirable coffee break. From the roasting process to the freshness valve on the pack, the exclusive Arabica beans selected especially for Carte Noire are treated to bring out the best in coffee: a subtle and intense aroma, deep yet sweet flavour sensations and an exceptional rounded body. With Carte Noire, taste the perfection of coffee. Carte Noire coffee is so deliciously intense that it has the power to stop time. In a world where everything is going very fast, the time one takes to sip a Carte Noire coffee becomes a privileged moment which allows one to stop, reconnect, and refill in order to recharge. Latte Macchiato? Espresso? With Jacobs, everyone can enjoy their favourite coffee beverage. The brand traces its beginnings to 1895 in Germany. That’s when 26-year-old Johan Jacobs opened a specialty coffee shop in Bremen. The appealing aroma and delightful taste is the perfect way to bring people together, no matter what the occasion! The Tassimo machines themselves are very affordable but people are often put off thinking that it must be expensive to constantly be buying pods. This was true a few years ago when they first came to market but not anymore. Today, you can find them everywhere meaning that you can buy them from your local supermarket and on lots of websites, like Amazon at huge discounts, making them very cheap. 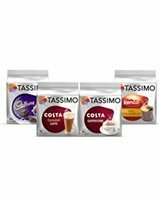 You can always find Tassimo pod deals and multipacks on offer which means that you can buy in bulk to reduce the price further. As mentioned above, the huge range of flavours on offer means that you will never run out of new flavours to try ever again. 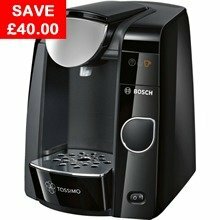 Combine the cheap price of the Tassimo pods with the cheap, easy and quick to use machines themselves and you can see why so many people are using them today. There are 3 models that use Tassimo pods or T-Discs, the Intermediate, the Suprema (which comes with Red or Silver highlights) and the Premium which comes in ‘Twilight Titanium’. There are 5 models of single cup coffee maker compatible with the “home-use” T-discs. However the T46 and T65 are no longer offered for sale in the US. These models are the T65, T55, T47, T46 and T20. While varying in price, color, availability of filter/display – they are functionally equivalent in that each maker will produce the same beverage from the same t-disc. Warning – There is also a Professional model designed for office and trade use. Tassimo pods designed for use in this model can’t be used in domestic machines. The Bosch Tassimo coffee range are an excellent choice, they are well made and are amongst the cheapest on the market today. They look more like traditional coffee makers and less like machines of the future and although they are slightly more traditional than the Nescafe Nespresso machines they fit in well in any kitchen today. the Bosch Tassimo Joy 2 coffee machine. Its price is excellent, I like the design and I can use a travel coffee mug easily which is great when I am rushing out the door. Also, it is incredibly easy to use with its quick heat up time and auto cleaning settings. Overall, the best price for a Tassimo coffee machine with great features. In 2018, sales of single-serve coffee capsules was valued at £4.3 billion with the US alone accounting for some £600 million in sales. A question we get asked quite often at My Virtual Coffee House is, which is best, Tassimo or Nespresso? So we thought we would try and help you objectively decide which is best for your needs. Objectively, both brands have served their respective customers well. If you are experiencing the dilemma of which would suit you, take heed that the bottom line is to know what you really want, what suits your needs. Both Tassimo and Nespresso brands of coffee machines are acknowledged for their ease of use. Simply put, you just need to insert the Nespresso capsule or Tassimo pod into the machine, press a button and voila, your drink is made, just how you like it. There is only a small difference – specifically in the time taken to have your hot beverage from the Tassimo pod as compared to that made with the Nespresso capsule. This is due to the time required to warm up water and filtering the coffee. It takes about a minute to make a cup of coffee in Nespresso against the approximate two minutes taken by Tassimo. The selection of drinks you can obtain from a Tassimo coffee machine as opposed to Nespresso present the first real difference between both of these brands. With its T-Discs or pods, Tassimo coffee machines offer you an array of about 85 different types of hot drinks from coffee, tea, hot chocolate, espresso, cappuccinos and lattes. Nespresso coffee makers, on the other hand, use capsules to make coffee, teas and hot chocolate. To date, there are some 200 selections to choose from. Owners of Nespresso machines do not currently have the option of making other hot drinks such as cappuccinos or lattes. Nevertheless, Nespresso claims it is working on such options to increase variety of hot drinks for its consumers. However, no dates have been released on when this would happen! There is really not much difference in the manner that T-Discs and capsules are used to make hot drinks in both types of machines. Having said that though, the Tassimo utilises its barcode technology to estimate the quantity of water to be used, the temperature of that water as well as the timing of the brewing cycle. This ‘intellegence’ to read, results in a more concentrated (strong) coffee as well as the ability to make cappuccinos and lattes, although making these drinks in the Tassimo does require an extra step. You must use the espresso T-Discs followed by the cappuccino or latte pods. I found that T-Discs are about £0.40 per cup while the capsules are slightly cheaper at about £0.38 per cup. Online stores such as Amazon offer more variety as compared to stores such as Tesco or Asda. Do you want to serve your family/guests coffee, tea and hot chocolate or do you also want to include espresso, cappuccino and latte in this selection? Are you a ‘strong’ coffee drinker? Most such coffee drinkers opt for Tassimo with their intelligent capsule system, as they claim that coffee made in Nespresso machines does not live up to their expectations even when they use the recommended bold or extra bold blend of coffee. Do you love Starbucks coffee so much that you cannot live without it even for a day? If you are, you might think about getting Nespresso as Starbucks is no longer producing Tassimo pods. As of March 2011, it will produce capsules for Nespresso. However, if you are a Costa Coffee lover, Tassimo now has you covered. The last thing you should worry about is whether the Tassimo or the Nespresso will fit well in your kitchen. Both machines are seriously aesthetically pleasing and I bet would fit quite snuggly on any kitchen counter top, they certainly look great in our kitchen. So just be true to yourself, and if you can answer the above questions, then you shouldn’t have any difficulty in making the choice between Tassimo vs Nespresso. Coffee pods have exactly the same nutritional value as any other coffee that you might drink and like regular coffee they are low in calories. Coffee, when drunk in moderation, also has several health benefits which you can read more about in our coffee and your health guide . One word of warning, obviously Cappuccinos, lattes, hot chocolate and other speciality pods have a higher calorie count, so again, everything in moderation! The biggest criticism of using a coffee pod machine like Tassimo is the mountain of waste created from your used pods. In recent years, this has got a lot of press with the German city of Hamburg banning coffee pod machines from all state-run buildings. To help with this issue, Tassimo UK and L’OR have teamed up with TerraCycle to provide collection points so you can recycle your T-DISCs, outer packaging, L’OR capsules, Kenco Eco Refill packs and coffee jar lids, and do your part in saving the planet whilst still enjoying great coffee. The scheme is run by volunteers with a network of collection points all over the UK. To find out more information, visit the Tassimo UK website – https://www.tassimo.co.uk/terracycle/s-2384/ or sign-up with TerraCycle. Tassimo teamed up with Warwick District Council in the UK to provide homes with the facility to recycle their pods free of charge with their normal recycling collections. The trial, which ran for 6 months and ended in September 2018, allowed anyone within the Warwick District Council catchment area, to apply for free ‘purple’ bags which were used for recycling the t-discs. At the end of the 6 month trial, the council had collected 110,302 capsules from 589 residents. Which was a great result. We would just like to say well done to Warwick District Council for leading the way with this green initiative and look forward to hearing more about the results in the near future. Want to find a new flavour? 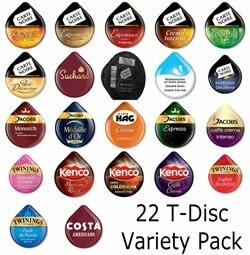 Check out our Tassimo coffee pods guide which lists every Tassimo pod available by category and brand, so you can find a great new taste from the Tassimo t-disc range and have it delivered to your door tomorrow!